Alexis Sanchez's equaliser earned 10-man Arsenal an important point as Spurs missed the opportunity to go top of the Premier League in the north London derby at White Hart Lane. Aaron Ramsey's instinctive flick gave Arsenal the lead just before the interval - but the game looked to have turned in the space of seven minutes before the hour. Arsenal's Francis Coquelin was sent off on 55 minutes after being shown a second yellow card for a foul on Harry Kane, leaving the door open for Spurs to respond with two quick goals. Toby Alderweireld scored at the far post before Kane curled in a magnificent angled right-foot finish after 62 minutes to put Spurs in command. But Arsenal refused to back down and equalised 14 minutes from time when Spurs keeper Hugo Lloris let Sanchez's shot squirm through his grasp. In contrast Arsenal's David Ospina, in for the injured Petr Cech, was heroic with outstanding saves from Erik Lamela, Kane and Christian Eriksen. Arsenal manager Arsene Wenger's plight could be measured in the amount of cameras that greeted him as he arrived in the technical area before kick-off - the natural indicator of either a new manager or a man under pressure. Wenger fell into the latter category after damaging league defeats by Manchester United and Swansea City, but he will have left White Hart Lane a satisfied man. Defeat would have turned up the pressure another notch, pushing that first title since 2003-04's 'Invincibles' season even further out of reach. Instead, he will have been happier than his Spurs counterpart Mauricio Pochettino and will feel Arsenal have restored some equilibrium to a season that felt on the brink of implosion. The Gunners are still in a reasonable position to challenge for the title - and Wenger would have taken that before kick-off. Arsenal rode their luck. Tottenham had 26 shots in all with seven off target (red) and eight blocked (yellow). Arsenal faced the usual questions - fully justified it should be said - about their stomach for a fight after succumbing to a youthful and injury-hit Manchester United and Swansea City in the past six days. If there was ever a place to at least answer some of the questions it was on hostile territory at White Hart Lane. And they emerged with credit. The tide was flowing fast against them after Coquelin drew a stupid yellow card. 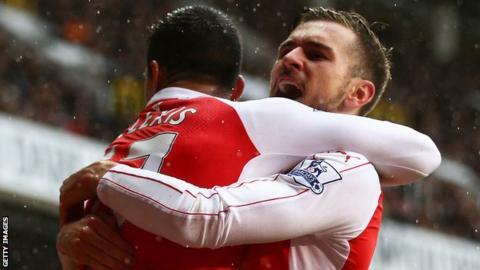 It would have been easy to feel it was not their day but the Gunners hung in and their persistence was rewarded. Wenger may feel his side might have gone on to win had they not been left with a numerical disadvantage - and they had a genuine grievance when referee Michael Oliver inexplicably failed to give Spurs' Eric Dier a second yellow card for a crude shirt-pull on Olivier Giroud. In many respects, this game was about avoiding defeat for Arsenal and they dug deep to stop the rot. Spurs could have no complaints when they lost at West Ham United on Wednesday. They were beaten by the better side, something that will happen in the fierce competition of the Premier League. It was a case of not too much harm done with Arsenal and Manchester City also losing - but here they missed a real opportunity. Spurs had that precious lead with Arsenal on the back foot and reduced to 10 men. All the momentum was with them as White Hart Lane sensed their old rivals were there for the taking. Instead, with Lloris the culprit and Gunners understudy Ospina superb, they let Arsenal back in. The chance to go top of the table, even for a few hours, was gone and while they remain three points ahead of their rivals in second place, Spurs will feel they should have extended the advantage. Arsenal face an FA Cup replay at Hull on Tuesday before hosting West Brom next weekend, while Tottenham have a Europa League trip to Borussia Dortmund on Thursday before Sunday's game at Aston Villa. Match ends, Tottenham Hotspur 2, Arsenal 2. Second Half ends, Tottenham Hotspur 2, Arsenal 2. Attempt missed. Christian Eriksen (Tottenham Hotspur) left footed shot from the left side of the box misses to the left. Corner, Arsenal. Conceded by Kevin Wimmer. Attempt blocked. Aaron Ramsey (Arsenal) left footed shot from the centre of the box is blocked. Assisted by Alexis Sánchez. Substitution, Arsenal. Joel Campbell replaces Mesut Özil. Attempt missed. Harry Kane (Tottenham Hotspur) left footed shot from the left side of the box is too high following a corner. Corner, Tottenham Hotspur. Conceded by Gabriel Paulista. Attempt saved. Alexis Sánchez (Arsenal) right footed shot from outside the box is saved in the top right corner. Hand ball by Kevin Wimmer (Tottenham Hotspur). Corner, Tottenham Hotspur. Conceded by David Ospina. Attempt saved. Christian Eriksen (Tottenham Hotspur) right footed shot from outside the box is saved in the top centre of the goal. Assisted by Harry Kane. Substitution, Arsenal. Mathieu Flamini replaces Danny Welbeck. Hand ball by Alexis Sánchez (Arsenal). Attempt blocked. Ryan Mason (Tottenham Hotspur) right footed shot from outside the box is blocked. Assisted by Christian Eriksen. Attempt saved. Dele Alli (Tottenham Hotspur) right footed shot from outside the box is saved in the bottom left corner. Assisted by Ben Davies. Ryan Mason (Tottenham Hotspur) wins a free kick in the attacking half. Goal! Tottenham Hotspur 2, Arsenal 2. Alexis Sánchez (Arsenal) right footed shot from the right side of the box to the bottom left corner. Assisted by Héctor Bellerín. Attempt blocked. Héctor Bellerín (Arsenal) right footed shot from the right side of the box is blocked. Substitution, Arsenal. Olivier Giroud replaces Mohamed Elneny. Attempt missed. Harry Kane (Tottenham Hotspur) right footed shot from the right side of the box misses to the right. Attempt missed. Harry Kane (Tottenham Hotspur) right footed shot from the centre of the box is close, but misses to the left. Assisted by Kyle Walker. Attempt missed. Danny Rose (Tottenham Hotspur) left footed shot from outside the box misses to the right. Assisted by Dele Alli. Attempt missed. Alexis Sánchez (Arsenal) right footed shot from outside the box misses to the left. Assisted by Héctor Bellerín. Substitution, Tottenham Hotspur. Ryan Mason replaces Erik Lamela.